Superman's comic magazines are published in many different languages and in many different countries throughout the world! 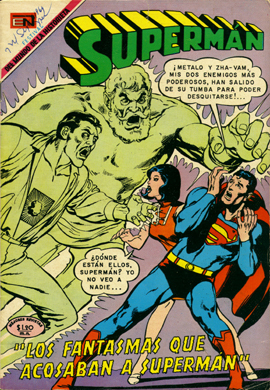 This issue of Supermán #724 was published in September 1969 in México. It contains two stories, both in Spanish. The first is about Superman apparently being haunted by phantoms resembling his many enemies - but all is not as it seems! The second is about Clark's first meeting with Perry White ("Pedro White") and his being hired as a reporter.